I admit, this recipe is kind of a pain to make. But I promise…it is worth it. The surprise of finding a warm gooey sauce inside of a perfectly fried ball is really magical (if you’re someone who fantasizes about food like I do). 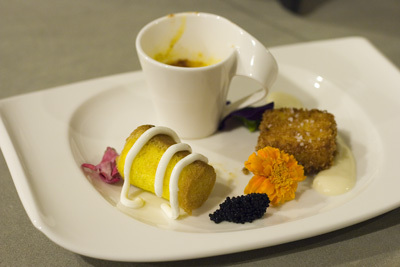 Ideally these little pouches of love should be made just before serving. But as we’re typically on our 4th (or higher) bottle of wine by the time I get to the main course, I’m not sure working with a 375 degree fryer is the safest or sanest choice. So I devised a way to keep the Bearnaise warm (so it doesn’t congeal and split) and crispy. While it isn’t perfect and the best bet is really to fry and serve immediately, I think it’s a reasonable substitute. 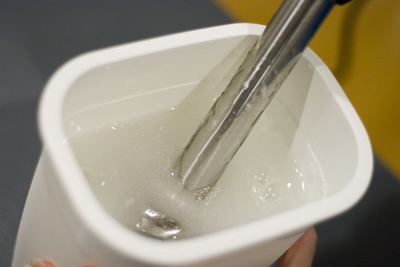 Using an immersion blender, mix the sodium alginate into the water. This may take several minutes given the gummy nature of sodium alginate. Be sure to scrape down the blender as much of the alginate may stick to it. Let the mixture rest overnight so that all the air bubbles escape. Alternatively you can use a Chamber Vacuum Sealer to remove the air from the liquid. 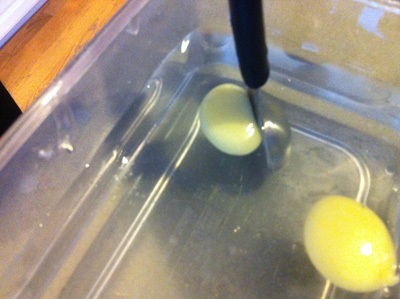 In a double boiler (or a metal bowl set over a pot of boiling water that doesn’t touch the bottom of the bowl) combine the egg yolks and water. 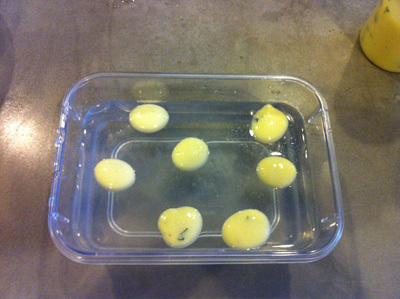 Remove from heat and slowly drizzle in the melted butter while continuously whisking the mixture together again until all the butter is incorporated and the mixture is emulsified. 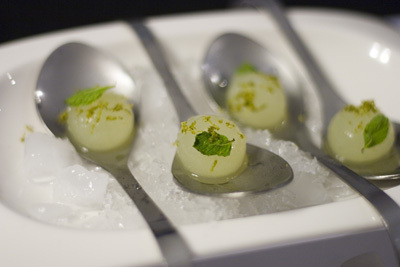 Completely submerge the teaspoon into the alginate and slowly turn it upside down shaking the sphere out of the spoon. With you hands, carefully remove one of the spheres from the water. Roll it gently in the flour to obtain a very light dusting. Remove from the oil and drain on a paper towel line plate. Season with salt while still hot. 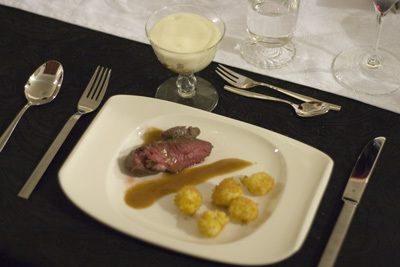 Ideally the Bearnaise spheres should be served immediately so they are warm on the inside and hot and crisp on the outside. Storing these spheres presents a dual challenge; the inside if cold will split and congeal and the outside will lose its crunch. A less than perfect, but better than nothing solution to this is to keep the spheres in a food dehydrator at around 150°F. 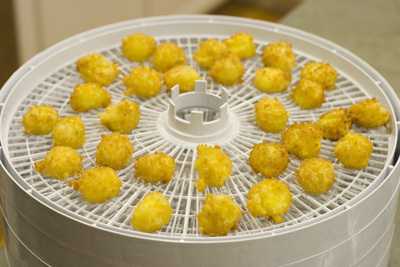 This will keep the sauce warm and emulsified while the air circulation will keep the outside crispy. You will lose some crunch and the extreme heat of the fryer, but it is a good substitute for those not wanting to mess with a deep fryer in the middle of dinner. These go very well with any steak or carpaccio dish…really any dish for which a traditional Bearnaise is appropriate. Encourage your guests to place a sphere on top of a piece of meat (rather than piercing it) so they get the full experience.